SINGLE BED QUILTING for straight edged pockets, hand technique only: leave needles OOW creating vertical ladders in location to correspond to side edges of pockets, have a loose tension row (at least 2 numbers higher, more if possible) to mark their tops. Both will serve to pick up stitches, loose rows help for turning of any hem when joinings begin. Knit half the length of the fabric required (create small hem that will in turn be at lower edge of the finished piece if preferred), continue knitting, picking up ladder loops closest to bottom turn prior to each pass of the carriage, continue until the loose tension row is reached, pick up all stitches as in a hem to seal the knit pockets, repeating the process throughout. 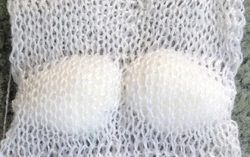 Hand technique combined with punchcard: slip stitches are a familiar tool in marking rows for picking up hems such as at the top of knitted skirts. They can also serve to create pick up bars, and the slightly narrower, shorter lining for a quilted fabric. Nearly all stitches and rows in card need to be punched, empty spots (non selected needles) will skip, creating marking “floats” for rehanging after completion of the first half of the piece. KC pattern selection is on, part <—>. Non selected needles on the second half of the piece will give a clue as to where to hang the floats, in turn bringing selected needles out to holding if desired. KC: needle selection is left on, no part buttons, carriage is now set to knit every row throughout. The fabric will be knit together in those spots on the next pass of the carriage. Decisions can be made as to whether to do this every row or every other. A self drawn possibility is below on left in which instance all white squares would need to be punched out, a possible factory pre punched on right. Not to be forgotten is appliqué, where separate shapes may be knit and joined onto the ground (knit in any desired stitch) technique by a seam as you knit method. DOUBLE BED QUILTING: carriage settings on brother are for circular knitting. Cast on for every needle rib with a familiar yarn, knit one or 2 rows, and to make a trial piece, set main carriage to slip to right, ribber carriage to slip to left. The ribber tends to knit tighter than the main bed, since large numbers of needles will be knitting side by side, the tension should be loosened at least one or 2 numbers while on the main bed the tension used should be closer to that used for the same yarn when knitting stocking stitch. Bring every X needle on main bed to hold position, knit 2 rows, and repeat to the desired length of the pocket. When the latter is reached, lower the ribber slightly, “stuff” pocket, bring all needles to hold position, the needle set up is with needles at halfway between each other (racking handle H as for every needle cast on ), so main bed may be brought to hold as well, knit 2 rows, and repeat process adjusting cam settings. The same principle applies here whether on patterning is used or not. With slip setting non-selected needles (B pos) slip, do not knit, and needles in D position or holding in hand tech, will knit and in this fabric seal the fabric. 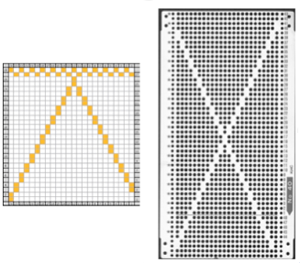 In the chart the symbols represent the stitches as they are formed on each bed to create a tube. The carriage icons show that opposite part buttons are in use on both beds. The ribber (odd numbered, white rows) knits left to right, slips right to left, MB (yellow rows) slips left to right, knits right to left, creating a tube. Automating the function brings us to another color separation of sorts. In single color quilting using simple tubular setting: Knitmaster machines work a bit differently than Brother, so cards/ mylars would have to be designed accordingly, Passap has some built in techs that can help with this. The settings below are for brother, and the card, for narrow vertical tubes. Width between punched holes could be adjusted to any factor of and up to every 24. Every row or every other row can be marked. Cast on for every needle rib. In this repeat when rows with no needle selection occur at its top , set both carriages to knit 2 rows (or bring all needles manually out to hold) to seal pockets. MB is set to slip in one direction, will knit on even rows, slip on odd rows as punched. The ribber is set to slip from right to left, and and knit from left to right. With carriages at KM’s left insert the card, lock on row 1. KC –> knit 1 row in rib from left to right, release card, and continue knitting. In Brother machines the tucking lever must be in the down, N position as well. When possible, tension on the main bed should be as loose as it will allow, if stuffing the pockets is planned. Without wadding the face can have a crumpled look with a smooth back. Going further in automating the repeat: this card portion includes the sealing rows (1 and 2): extend repetitions of rows 3 and 4 until length of desired pocket is reached for your DIY repeat. The ribber is set to slip from right to left, and and knit from left to right, the main carriage to knit from left to right, and to slip from right to left (opposite part buttons). With carriages at right insert the card, lock on row 1. KC <–, knit 1 row in rib from right to left, release card (or mylar), and continue knitting to desired length. Make certain there is an even number of rows between each pair of sealing rows in your own design. It takes pairs of carriage passes to complete each circular round. To use the repeat below as a continuing pattern, one row in its height would need to be removed or added.